Kid Rock’s Made in Detroit Scholarship is open to undergraduate and graduate students who are currently attending Wayne State University in Detroit, Michigan. Students must live in Michigan and have a financial need that might otherwise prevent them from attending college. The scholarship is particularly designed for students majoring in music, music technology, music business or other music related majors. However, all students enrolled either part-time or full-time at Wayne State University may apply, regardless of their field of study. The scholarship is renewable and may be used for tuition and other educational expenses. The scholarship was established in 2008 by rock star Kid Rock to support music and other talented students in the Detroit area. 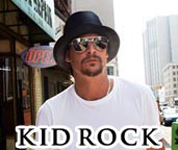 Proceeds from a limited-edition Kid Rock t-shirt funded the scholarship at Wayne State University. Eligible students do not have to meet a minimum grade point average. They must reside in the Detroit area, attend school at Wayne State University and document that they have financial need in order to attend and graduate from college. Wayne State University is located in Midtown, Detroit, in the heart of music, culture and the arts. The university was named by Rolling Stone magazine as one of the nation's top "Schools That Rock." The deadline for this scholarship is usually in FEBRUARY of each year, and the award amount is usually $500.